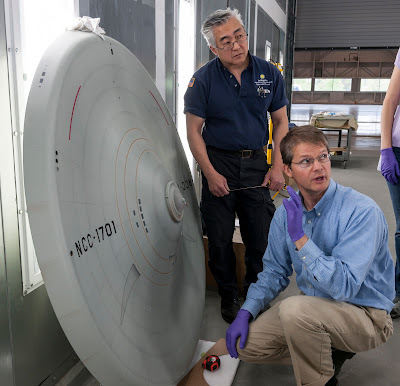 Almost two years ago the original studio model of the USS Enterprise left it's home in the gift shop of the Smithsonian Institution's National Air and Space Museum to spend some time in spacedock for a major overall. 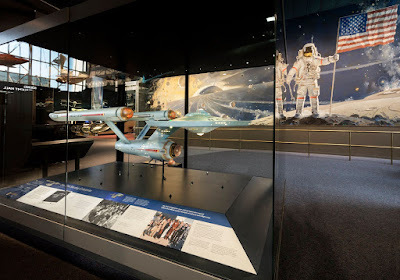 After months of repairs, reinforcements, new lighting installations, and a fresh coat of paint, the Enterprise has now returned, to a new place of honour in the new look Boeing Milestones of Flight Hall. 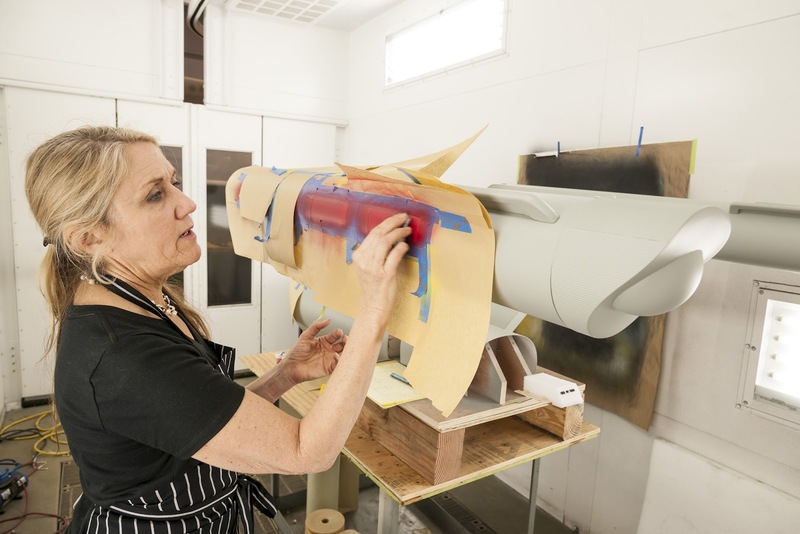 The model sits aside other significant artefacts from the history of flight and space exploration, including Sputnik, an Apollo lunar module, and SpaceShipOne. 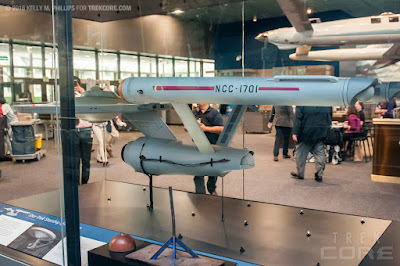 TrekCore have visited the display, and have a good gallery of shots, including this view of the rear, which in contrast to the other side, make's the model's use from television production obvious. The original stand is also on display. You can get a good look at other exhibits in the hall in a good report from Collect Space. 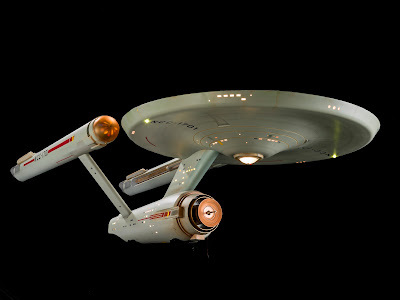 Then the whole model (minus the upper saucer paint, of course, which is original paint from the 1960s) was painted with a base color that had been carefully matched by the Museum’s Dave Wilson to the production base color that had been uncovered in multiple places on the model in sanding tests. A full-scale mockup of several of the model’s parts (nacelles and secondary hull) provided a way to test paints, techniques, and finishes before applying any paint to the actual artifact. The two-hour special also profiles a new generation of engineers and scientists who are making Star Trek’s visionary technology real, pushing the boundaries of physics with inventions first conceived on the iconic series: warp drives, medical tricorders, cloaking devices and tractor beams. Proving that one TV show has truly gone where no man has gone before, BUILDING STAR TREK will showcase clips from the original series that highlight each scientific innovation and the new technologies that have inspired generations.